The market is filled with travel mugs of all sizes and shapes, but is every model suitable for your needs? Probably not; this is why it is essential to highlight how important it is to understand your own requirements before buying one. Are you traveling by plane, by car or by bus a lot? You live in a cold climate and you would like your fresh coffee or tea to maintain its temperature for as long as possible? Then you have to choose a travel mug that has specific characteristics. One-hand use – if you have to use both hands to sip from your mug, then it is practically useless. Chose one that doesn’t have a lid that needs to be unscrewed, for your own comfort. Leak-proof lid – spilling coffee on your clothes or car is not an option. Choose a travel mug that has impeccable sealing, so you don’t have to worry about leaks. Are you looking to buy one of the best travel mugs? Do you want one that is comfortable to use, modern and stylish? Then check out the 5 products that we have selected for you. 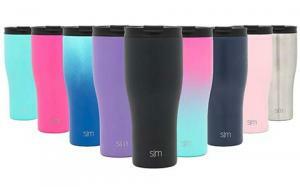 These are best-selling travel mugs that we have selected from hundreds of models. Read the pros and cons of each product before making a decision. A 20-ounce travel mug is exactly what you need if you travel a lot by car or if your job implies traveling a lot. This mug from Simple Modern has a gorgeous design and it is meant to keep your beverage, be it tea, coffee or just water at the right temperature. It comes in 45 different colors and patterns that you can choose from. The original designs and degrade color tones are ideal for someone who loves to bring a little bit o color into their every day life. This product can also be found in smaller sizes. 10 and 16 ounces mugs are also available, as well as a larger 24-ounce one. This mug is vacuum insulated, with double walls, which means that the temperature of the beverage will be kept the same for a few hours. It comes with 2 lids: a straw lid and a flip lid. The straw is included in the package, so you will not have to buy it separately. The exterior of the mug is matte powder coated and the interior is made of 18/8 stainless steel. Its finish is durable and fashionable, so it will be a pleasure using this mug. Thanks to its shape, with a thin lower part, it is compatible with most cup holders, so it will be safe to use in the car. This product measures 10.8 x 3.7 x 3.6 inches and weighs only 1.1 pounds, which makes it very comfortable to use. If you are a pretentious person and you usually prefer to pay more for products that you know can guarantee the quality that you are looking for, then this product could be the one to meet all your requirements. 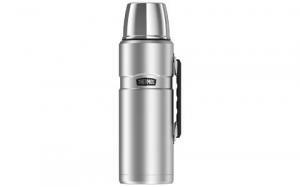 This is a thermos that can be used as a travel mug, especially if you travel long distances often. It has a large capacity of 68 ounces, so you will always have enough of your favorite beverage with you. Giving the vacuum insulation technology that was used to create this product, the beverage’s temperature can be maintained for up to 24 hours. You will never have to worry about your coffee or tea getting cold again. Both the interior and the exterior or this travel thermos are made f stainless steel, which makes the product durable and safe to use. It is sweat-proof and remains cold to touch when filled with hot liquids. It comes with a serving cup that is also made of stainless steel. Its design is compact and elegant. The fold flat handle makes it easy to manoeuvre even though it is such a large bottle. It has a twist and pour stopper that allows you to pour without having to remove the stopper every time. The same product is available in midnight blue and matte black. It measures 4.4 x 5 x 14.5 inches and it weighs 1 pound. 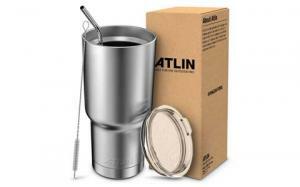 If what you are looking for is an inexpensive, yet durable travel mug, Atlin Sports’ product might draw your attention. Although this isn’t a product capable to maintain your beverage’s temperature for 24 hours, it still does the job it was built for, which is to keep your beverages cold or hot for a few hours. This is a travel mug that comes with a minimalist design, in 4 different colors: white, orange, turquoise and stainless steel. It is sleek, it has a nice grip, made of BPA free stainless steel and plastic and it is dishwasher compatible. It is double insulated, it has a transparent lid and a capacity of 30 ounces. Hot beverages such as coffee and tea can be kept warm in this mug for approximately 6 hours. On the other hand, cold liquids can be kept at the same temperature for up to 24 hours. The stylish box in which this product is packed includes the transparent lid and a straw cleaner. It also includes a stainless-steel straw, so you won’t have to buy that one separately. Thanks to its slim lower side, it can be placed in any cup holder. Travel mugs that look like a thermos are great, but they aren’t for everyone. Some people find them too large or bulky, while some miss the beautiful handle of a real mug. 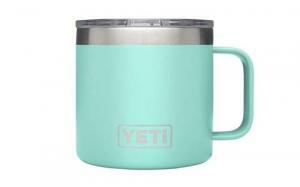 Yeti is trying to do exactly that: imitate a regular mug’s design, by mixing the benefits of a thermos with the shape of a mug. This 14-ounce product isn’t as large as a thermos, but it is suitable for short trips or for mornings in the car. It comes in 9 different modern colors, from black to mint. Although it doesn’t seem so sturdy at the first glance, it is an over-engineered product that is meant to last. It has a full-loop handle and duracoat finish, which ensures that your mug will not get scratched or peeled over time. Just like regular high-quality thermoses, this travel mug has double vacuum insulation and two walls. The interior is made of 18/8 stainless steel, which helps you rest assured that it will not rust. Also, it can be washed in the dishwasher after every use. This mug measures 5 x 4 x 3.75 in and weighs only 14 ounces. The lid is also made of stainless steel and it is protected by another layer of plastic. It is designed for sipping, so you won’t be able to use a straw. However, this is one of the best options for those of you who don’t need a large travel mug. A travel mug has to be, more than anything, functional and durable. A secondary factor that might influence your decision is its design. If you like all of your accessories to be fashionable, modern, with a fresh look, then this travel mug from Ello was made for you. It is an inexpensive product is made of ceramic, has a beautiful diamond pattern and a sip lid that makes drinking easier and more comfortable. It comes in 8 dynamic colors that you can choose from. The mug is silicone insulated, so it is capable of keeping the beverages cold or hot for a few hours. It has a splash-proof lid, which is not leak-proof, too, so you have to be careful. 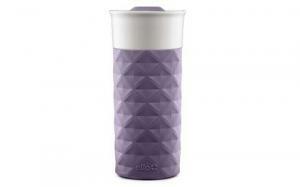 Ello’s travel mug has an extra layer of insulation and a great grip thanks to its patterned surface. After use, it can be washed in the dishwasher, including the lid. It has a capacity of 16 ounces, which is more than enough for a short trip or your daily commute to work. It is BPA and BPS free, so you don’t have to worry about the risk that these chemicals imply. It measures 3.3 x 3.3 x 7.3 inches and measures only 14.9 ounces, which makes it lightweight and comfortable to use. Before buying a travel mug, make sure that you know what the characteristics that you need are, as well as the purpose of use. Also, remember that a stainless steel travel mug can’t be put into the microwave if you want to re-heat your drink. The better solution is choosing a product that has great heat-retention properties. If you only drink coffee once in a while, but you are a heavy tea drinker, make sure that the mug that you choose has an infuser, too. There are plenty such models available on the market, but only a few are high-quality. If a travel mug meets all of you expectations in terms of design, durability and comfort, then don’t think twice. The five products that we selected are high-quality options, with awesome designs and great utility. Look at their pros and cons before buying one of them and remember that we have taken into consideration personal observations, as well as consumer feedback while reviewing them.